Apple‘s new iPhone is due to burst upon an unsuspecting world in barely two weeks, with a staged, international roll-out. But Apple is seriously banking on this thing selling like hotcakes. And by hotcakes, we mean millions a month. The first iPhone took 76 days to sell a million units, but then the phenomenon took off like a rocket leaving the launch pad, and the 3G took just three days to reach the same target. The 3GS model sold at the same initial rate. Of course, after the initial surge, the rate slowed down, and Steve Jobs recently revealed that 50 million total have been sold to date. That’s a lot of phones, especially in the high-cost smartphone market (though it’s dwarfed by Nokia’s millions upon millions of sales of cheaper dumphones). But according to the chairman of Asia Optical, Robert Lai, whose firm has been making the lenses for the front-facing VGA resolution cameras of the iPhone 4, Apple fully expects the new iPhone 4 to sell faster and at a more sustainably higher rate than any of its predecessors. Why do we know this? Because Apple’s been ordering enough components from Lai’s company to churn out over 3 million production units every month. That’s enough, assuming they all sell, to easily beat the purchase history of the best 3GS sales quarter by some 20%. And it’s easily enough for Apple to sell more than 10 million of them by the end of this year alone, adding 20% to the number of total iPhones sold. 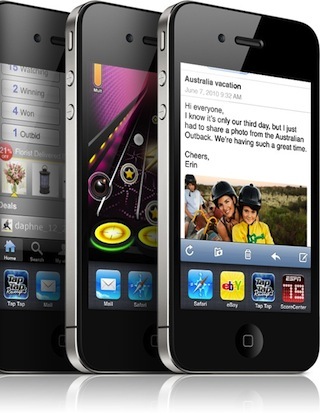 In other words, Apples’ betting the iPhone 4 is going to be its best-selling product yet. It’s unlikely it would be investing in so much hardware up front, otherwise. Part of the way Apple may be about to achieve this kind of sales rate is by allowing the phone to be sold through more vendors than ever before: In the U.K., for example, it’s now known that all five major networks will be selling the iPhone. And this thinking, perhaps more than any other to date, hints that the AT&T iPhone exclusivity in the U.S. is on its deathbed. The only thing holding us back from saying “we’re sure” is that the iPhone is going to be sold in Target stores in the U.S. too right from its launch day, and possibly also at Radio Shack and Best Buy outlets. With Walmart recently confirming it’ll be selling the iPhone 4 from launch day, it seems that Apple is trying everything it can to push iPhone sales in the U.S. without resorting to supporting multiple carriers. With this week’s iPad security shenanigans, however, you never know how they might rethink this policy. To keep up with this news, follow me, Kit Eaton, on Twitter. That QR code on the left will take your smartphone to my Twitter feed too.